I know a lot of schools use the Accelerated Reader program, and I have been using it for years. But, I'm embarrassed to say that I have no idea how the points work. Our fourth grade team is really into it and when the kiddos come to 5th grade and tell me about all the AR points they've gotten I really don't have a clue what they are talking about. So, how do I use AR without the goals you ask? Our wonderful librarian has a millionaires club and gives awards to students who read a half million words or more each year. I figured this would be a way more motivating and fun way to encourage my kids to read without worrying about points and levels. And it is! Even I participate! 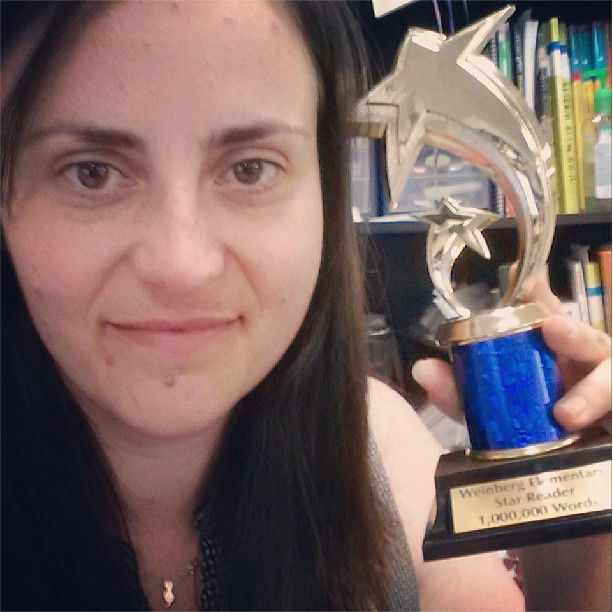 Here I am with my millionaire trophy! Every year, at the beginning of the year, I challenge my class to read more words than me by the end of the year. Usually 2 or 3 beat me, and this year I have several already way ahead. I've got some serious reading to do! Now, I realize that the millionaires club is not for everyone, but I do expect my students to make AR goals each quarter. Typically, the minimum that my 5th graders choose is 80,000 words. Sound like a lot? Not really. This is about 2-3 grade level books. In an effort to help my students track their goals I created a simple and easy to use tracking sheet. 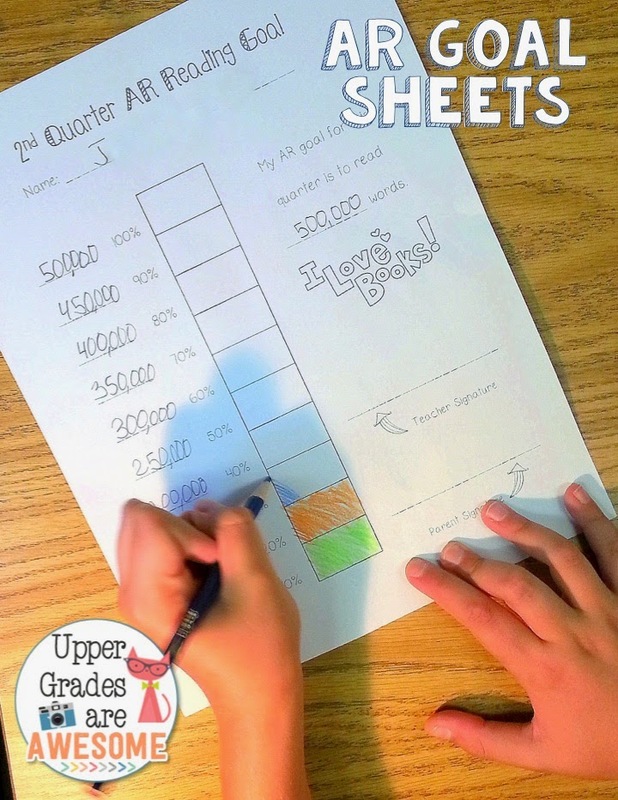 They write their goal, find out each 10%, and color it in as they read and pass tests. So far this is helping them stay on track and working towards their goal. The great thing about these forms is that they don't just have to be used with word-count goals. They can be used with the AR point system as well. I wanted to share them with my teacher friends and they are super cheap in my TpT store. There are forms for quarters, semesters, even trimesters, so they are easily adapted to how you use AR in your classroom. I'd love to hear about how you use AR in your classroom! 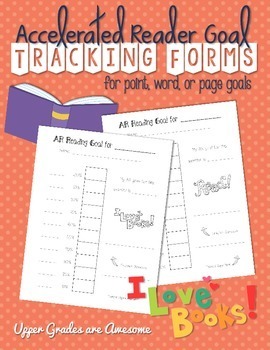 Be one of the first three to comment and leave your email address and I'll send you the AR Goal Sheets! My AR is divided into three categories. The kids who meet their AR goal the first trimester receive a Bachelors Certificate, second trimester is Masters Certificate, and if they meet all three they receive a P.H.D certificate last trimester. They love to see their name under these categories. I also have a string for each student and for every hundred words they read I staple a 100 dollar bill and the kiddos that reach a million get a special something!! Thanks for this chance to win your amazing resource. We are new to using AR this year and I think your goal setting sheets would be perfect for our students. Thanks for sharing.